We’d love your help. Let us know what’s wrong with this preview of The Black Stallion and Satan by Walter Farley. Satan has won the Triple Crown, yet Alec still misses the Black, who’s living in Arabia with Sheikh Abu Ishak. Unexpectedly, Alec receives word that the sheikh has died and has left the Black to Alec. A race between the Black and Satan is inevitable, but unexpected events put the horses in the path of a raging forest fire. Suddenly, they are racing for their lives. To ask other readers questions about The Black Stallion and Satan, please sign up. Now this is more like it. The Black is back, with his small, proud head, his finely molded muzzle, his arrogant carriage! And Alec, impetuous and wrong-headed, sure of himself and his stallion. Also Henry, wise, grizzled and always right. Plus adventure! Fires! Horse fights! Horse races! Police action! Every bit as good as I remembered, but I'd forgotten the painfully awful Italian dialect Farley put in the mouth of Tony who is always referred to as "the huckster". Itsa beeg, beeg shame, thatsa Now this is more like it. The Black is back, with his small, proud head, his finely molded muzzle, his arrogant carriage! And Alec, impetuous and wrong-headed, sure of himself and his stallion. Also Henry, wise, grizzled and always right. Plus adventure! Fires! Horse fights! Horse races! Police action! When I read Farley's work I am always amazed at how capable he is of capturing the essence of action and suspense in his adventure stories. You would think that he carried a tape recorder around with him and dictated chaotic events as they were happening so that they could be used later, because the action is so perfectly done, it's as if you're watching it or listening to it yourself. All of this is done without the lengthy descriptions that some authors rely on to express danger or distress. T When I read Farley's work I am always amazed at how capable he is of capturing the essence of action and suspense in his adventure stories. You would think that he carried a tape recorder around with him and dictated chaotic events as they were happening so that they could be used later, because the action is so perfectly done, it's as if you're watching it or listening to it yourself. All of this is done without the lengthy descriptions that some authors rely on to express danger or distress. The masterful way that Farley can give just the right amount of information to engage your brain while letting your imagination automatically fill in the rest is simply beyond measure. The main characters in this book are Alec, Henry, and the Black. Alec is the jockey and trainer of the Black and is the only person that can ride the wild stallion. Henry is there to help Alec if needed and enter the Black in races. The setting of this book first takes place in Alec’s barn when he gets this later from Abu Ishak’s daughter sends Alec a letter telling him that he will be getting the Black back because he died when the wild stallion threw him off. They tried to keep him in hiding b The main characters in this book are Alec, Henry, and the Black. Alec is the jockey and trainer of the Black and is the only person that can ride the wild stallion. Henry is there to help Alec if needed and enter the Black in races. The setting of this book first takes place in Alec’s barn when he gets this later from Abu Ishak’s daughter sends Alec a letter telling him that he will be getting the Black back because he died when the wild stallion threw him off. They tried to keep him in hiding because they didn't want the company, but after a while reporters found the Black and persuaded Alec to let the Black race one last time in the International race. Then, the book took place at the International racetrack, but a horse had to be put down because it had swamp fever. Then, the rest of the book took place in a quarantine barn because the horses needed to be monitored to see if they had come down with the deadly illness. The conflict of this book is when the horses are in the barn and a forest fire burns the barn. People get the horses out and instead of heading away from the fire they head into the pasture and get trapped by the fire. The Black was the last one out of the barn, and when the Black ran by Alec he hopped on the stallion without any tack and guided the horses in with the other stallions that were trapped in the pasture. Alec finally fixed the conflict in the book because he found a gate in the pasture that led to the valley. He tried and tried to get the stallions to go through the gate, but they were too terrified by the raging fire. Now, there was a slight fire that blocked the gate, but that wasn't going to stop Alec from trying to save the stallions. He tried one last time before the fire reached them. One by one the stallions jumped over the fire and ran down the lane towards the valley! A few burning pieces off of trees landed on the stallions but they kept on going. Finally, the horses reached the valley and beat the fire! My opinion of the book was that it was really amazing. When El Dorado had to be put down because he had swamp fever and that the other horses might have swamp fever too, I got so excited and had this weird feeling in my stomach. I just wanted to keep on reading. I never knew what was coming next and it made everything all the better. It was such an awesome book. I would recommend this book to people that are really into excitement and horses together. It was amazing! This review has been hidden because it contains spoilers. To view it, click here. I've been transported back into my childhood - longing with Alec to see Black again, hoping that he'll won't want to fight, being terrified that Black and Satan caught the Swamp fever and being on the edge of my seat when Alec rides Black to save the horses from the fire. ♥ Wonderful! Who is faster -- The Black or his son Satan? Imaginative way for readers to find out. Keep in mind that this book was written decades before international travel for horse races became the norm. When I was a kid and The Black Stallion movie came out in 1979 or so, I was secretly hoping that the whole series would be filmed -- or at least up to this book. This book also gives a spotlight to the Black's long-suffering friend, the grey gelding Napoleon. I think he's mentioned in The Black Stallion's Who is faster -- The Black or his son Satan? Imaginative way for readers to find out. Keep in mind that this book was written decades before international travel for horse races became the norm. When I was a kid and The Black Stallion movie came out in 1979 or so, I was secretly hoping that the whole series would be filmed -- or at least up to this book. This book also gives a spotlight to the Black's long-suffering friend, the grey gelding Napoleon. I think he's mentioned in The Black Stallion's Filly but that's about it with him in the series. I always wondered what kind of magic Napoleon possessed to calm the Black down, since he wasn't female. Now that I'm an adult, I now wonder if there was some sort of "special" relationship between the Black and ol' Nappy. Walter Farley has done it again in another classic book of the Black and Satan! If you love his stories about The Black Stallion, I would recommend reading this book. "You got to have respect for what any horse might do." Ah, The Black and Satan, my favorite literary horse, and a literary horse that annoys but captivates me. Here together. The thing I love about The Black is that his bond with Alec is so strong. It's what every little girl wants with a horse (or maybe because I grew up reading The Black Stallion that's what *I* wanted with a horse). But Satan is just wild. We've got them basically pitted against each other here. The Black never got to race in t "You got to have respect for what any horse might do." My daughter says this was one of the most exciting Black Stallion books we’ve read so far in the series! I doted on all the Black Stallion and Red Stallion books as a teenager. I had the whole collection until I gave them to my granddaughter, who is an excellent rider. A good read for kids. I only read the first then this one but it was still awsome! This review has been hidden because it contains spoilers. To view it, click here. What a relief! The Black proves himself faster than his son. And Alec is mature enough not to gloat to Henry about it. This was, as always, thrilling and riveting! But this time, the ultimate race doesn't take place on the track, but in race against a fire! Do not be discouraged by the title of the book. Satan is the name of the Black's colt. Over all it is pretty good. In the fourth instalment of the series, Alec is facing a crisis - he loves racing Satan, but has begun to feel as if the horse is no longer his. He longs for the days when he had the Black - so when he receives a letter to say that the Black is returning and will be his for real, he is over the moon. But word gets out and soon everyone is speculating as to which is the fastest horse - the Black or his son. A race is devised, with some of the top stallions from around the world invited to take pa In the fourth instalment of the series, Alec is facing a crisis - he loves racing Satan, but has begun to feel as if the horse is no longer his. He longs for the days when he had the Black - so when he receives a letter to say that the Black is returning and will be his for real, he is over the moon. But word gets out and soon everyone is speculating as to which is the fastest horse - the Black or his son. A race is devised, with some of the top stallions from around the world invited to take part, but before it can be run, tragedy strikes. Eventually, it's only Alec who finds out who is the fastest. The Black Stallion and Satan is the culmination of everything we'd been waiting for in the series up to that point. Though Alec was granted the first son of the Black, Satan, we knew that his love for The Black could not be overshadowed. It is only a matter of time, in the readers' minds, until these two are reunited. And so here it finally happens - the Black is coming back for good. Meanwhile, Alec and Henry have turned Satan into a racing machine. And so now what? Well, now you have this fant The Black Stallion and Satan is the culmination of everything we'd been waiting for in the series up to that point. Though Alec was granted the first son of the Black, Satan, we knew that his love for The Black could not be overshadowed. It is only a matter of time, in the readers' minds, until these two are reunited. And so here it finally happens - the Black is coming back for good. Meanwhile, Alec and Henry have turned Satan into a racing machine. And so now what? Well, now you have this fantastic and tension-filled story of two strong stallions, both with a tie to Alec Ramsey, meeting. And you have the question - which one is faster, the sire or his son? I don't have much to say about this one.... There's a lot of lead-in to what ends up being an extremely rushed climax. That was pretty disconcerting. Also, I wish Farley would have realized that he's crap at having his horse characters meet up in a race, because he loves them all, and stopped doing it. And I think we all figured that the Black was going to (view spoiler)[end up being faster than Satan (hide spoiler)], so we didn't really need a book about it, but the premise was actually okay, if I don't have much to say about this one.... There's a lot of lead-in to what ends up being an extremely rushed climax. That was pretty disconcerting. I started re-reading The Black Stallion series by Walter Farley in April and read five more from that series in May: Son of the Black Stallion, The Black Stallion and Satan, The Island Stallion, The Island Stallion's Fury, and The Blood Bay Colt. Only The Black Stallion and Satan was as enjoyable as when I was a kid, though I remember never really caring for the Island Stallion "spin-offs" or the two books on harness racing. Where's Alec and The Black? Bring 'em back! 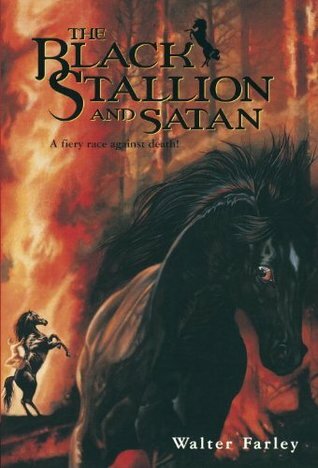 This was the second Black Stallion book I ever read and I was confused when it started with a different horse, having missed the introduction of Satan in the previous novel. Once I got over my confusion, I found it very enjoyable and though it was well written and well thought out. Loved the exciting race at the end. I'm weeding this because when I opened it the pages fell out, but seriously this has got to be the most awesome title ever. Also it was a trifecta of win when I also found a trippy book about white horses and witchcraft that takes place in Columbus. Now that Alec inherits the Black back, this series got good again. I was glued to this book to see what would happen! And it touched my hear to the point of tears to see what Tony and his Nappy (Napoleon) did for Satan and the Black. I enjoyed the characters, and their world and hope I get the chance to read the story again and/or to read more within the series. Who is faster, the Black Stallion or Satan, his son? No one really knows. The race of the century is on! And off, as the horses to race are strike with Equine Infectious Anemia and must be quarantined. Will the two great stallions face each other, or will they never make it to the track? I raced through this series as a child. Of course, "The Black Stallion" was my favorite, and I read it a few times, but I waited eagerly for any of the books to return to my branch of the library so I could snap them up. I included this book because it was one of those books that I read as a child that opened the door to "Reading For Pleasure" for me. I recently found an old copy at a 2nd hand book store so I hope to reread it soon. Walter Farley's love for horses began when he was a small boy living in Syracuse, New York, and continued as he grew up in New York City, where his family moved. Young Walter never owned a horse. But unlike most city children, he had little trouble gaining firsthand experience with horses-his uncle was a professional horseman, and Walter spent much of his time at the stables with him. "He wasn't th Walter Farley's love for horses began when he was a small boy living in Syracuse, New York, and continued as he grew up in New York City, where his family moved. Young Walter never owned a horse. But unlike most city children, he had little trouble gaining firsthand experience with horses-his uncle was a professional horseman, and Walter spent much of his time at the stables with him. "He wasn't the most successful trainer of race horses," Mr. Farley recalled, "and in a way I profited by it. He switched from runners to jumpers to show horses to trotters and pacers, then back to runners again. Consequently, I received a good background in different kinds of horse training and the people associated with each." finished it while he was an undergraduate at Columbia University. It was published by Random House when he was 26. He used his first advance to go traveling and after that hardly stopped longer than it took him to write another book. He traveled and lived in Mexico, Hawaii, the South Seas, most of the South American countries, the Caribbean Islands, and Europe. The appearance of THE BLACK STALLION in 1941 was hailed by enthusiastic boys and girls all over the country. An avalanche of mail urged Mr. Farley to write more about Alec Ramsey and the Black. But World War II intervened. Mr. Farley went into the US Army, where he spent the next five years. Most of the time he was assigned to Yank, the army weekly magazine, and he was also trained in the Fourth Armored Division. After the war Walter Farley resumed the adventures of Alec and the Black with THE BLACK STALLION RETURNS. This was followed by SON OF THE BLACK STALLION. Then Mr. Farley tried his hand at a story about a new boy, Steve Duncan, and a new horse, Flame, in THE ISLAND STALLION. Mr. Farley's readers were just as delighted with this book as his others. Mr. Farley went on to write many more stories about the two stallions, and about other horses as well. Children of all ages have found Farley titles to enjoy, since many of the later stories were written for Mr. Farley's own children when they were too young to read his Stallion novels. And older readers and adults have been gripped by his fictionalized biography of America's greatest Thoroughbred, Man O'War. Walter Farley's titles reached a grand total of 34. The 21 Black Stallion and Island Stallion stories are still in print and selling steadily. His readers respond with passion, writing him thousands of letters and emails every year. In May 1949, the first Black Stallion Club was founded, in Kentucky. Mr. Farley designed a membership button for it; the button was in constant demand among his readers for years. The Black Stallion books were so popular in the late 1940s and '50s that they York Times annual list of best-selling children's books. Three nationwide Black Stallion contests were held. Walter Farley's books have been published abroad in more than 20 countries, including Austria, Czechoslovakia, Denmark, England, Israel, Finland, France, Germany, Holland, Iceland, India, Indonesia, Italy, Japan, Malaya, Norway, Russia, Saudi Arabia, Sweden, and Switzerland, as well as in the United States and Canada. All his life Walter Farley remained a keen spectator of the racing scene, and he enjoyed nothing more than hobnobbing with horse trainers and other professional horsemen. It is thanks to these people that his books are so full of authentic details of raising and training horses. When not busy working or traveling, Mr. Farley liked to ride dressage and high school Lippizaner horses. He also sailed and sometimes raced his 35-foot auxiliary sloop "Circe."